Virtually from its redaction about the sixth century A.D., the Babylonian Talmud became the rabbinic document par excellence. Through its lens almost all previous canonical rabbinic tradition was refracted. Study and mastery of the Talmud marked one as a rabbi, a “master.” This book examines the character, use and social meaning of the formalized rhetoric which pervades the Babylonian Talmud. 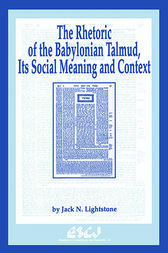 It explores, first, how the editors of the Talmud employ a consistent and highly laconic code of formalized linguistic terms and literary patterns to create the Talmud’s (renowned) dialectical, analytic “essays.” Second, the work considers the social meanings implicitly communicated by the use of this rhetoric, which not only provided an authoritative model for modes of thought and for treatment of earlier authoritative Judaic tradition, but also reflected, reinforced or helped engender new social definitions. Through comparison of the Talmud’s rhetoric with that of other, earlier rabbinic documents and by placing the editing of the Talmud against the backdrop of the social and political situation of Rabbinism in the Late Persian Empire, the book relates the Talmud’s creation and promulgation to a major shift in Rabbinism’s understanding of the social role, “rabbi,” and to the emergence and ascendancy of the talmudic academy (the Yeshiva) as the primary institution of Rabbinism toward the end of Late Antiquity. In its agenda, and methodological and theoretical perspectives, The Rhetoric of the Babylonian Talmud brings together the insights and tools of historical, literary and rhetorical analysis of the New Testament and of early rabbinic literature, on the one hand, and the sociological and anthropological study of religion, on the other.